It’s not often that you will see an accordion, a violin and a kora being played on the same stage. Matter of fact, it was apparently the first time ever for a Musicfest concert. When celebrated violinist and consummate performer Regina Carter decided to record Reverse Thread, an album best described as a heady fusion of infectious African folk songs and contempo jazz, she was left with the challenge of reproducing the magic of the studio on the concert stage. The solution was to bring along three of the musicians involved in the project plus Lamin Kuyateh replacing Yacouba Sissoko on the African kora. The result for audiences is not just simply engaging, but breathtaking. Ms Carter strolled out on to the Vogue stage dressed in a floor length white dress and short orange jacket to the musical intro N’Teri by Malian Habib Koité. With barely a silent pause the quintet stormed straight into Amadou & Mariam’s syncopated Artistiya featuring Kuyateh’s gorgeous kora playing. The kora is a 21-string African harp that resembles a large lute with a long hardwood neck and a half calabash resonator. It’s generally played upright with the neck pointing up and it gives up a trance-inducing sound somewhere between a Celtic harp and the marimba. Based on a selection of field recording from Ugandan tribeswomen, we then heard Mwana Talitambula (the child won’t walk). Bass player Chris Lightcap has rearranged the melody to suit the pairing of violin and acoustic bass to dazzling effect. Another tune introduced by an ethnographic field recording is Zerapiky that features some virtuoso solo accordion work by Will Holshouser. 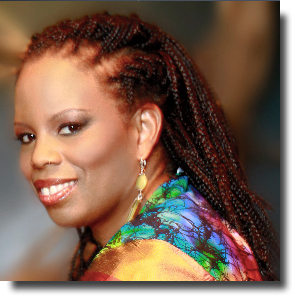 Regina Carter is a democratic as well as an inspirational leader who doesn’t always occupy centre stage; preferring sometimes to play the seasoned follower when allowing exhilarating solo percussion streams by her husband Alvester Garnett.